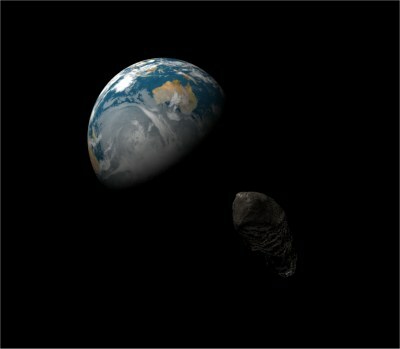 This view depicts asteroid 4179 Toutatis on 29 September 2004 when it will pass the Earth at a distance of 1,960,000 km. The field of view is only 2°. 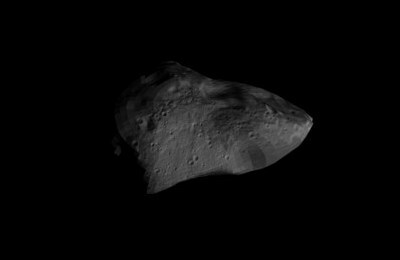 Toutatis is among the larger known Earth-grazing asteroids. The Earth uses the surface and cloud maps from James Hastings-Trew. The cloud transparency is colored plain white, however, in contrast to the white-and-blue cloud map. Toutatis is from the POV-Ray shape model by Scott Hudson of Washington State University (my rendering of the model is somewhat inferior and does not do justice to Hudson's shape model). 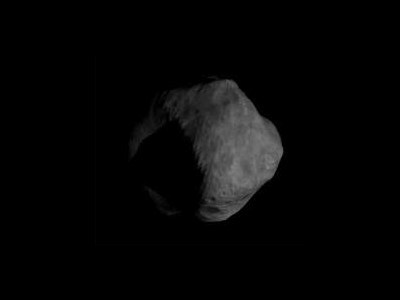 This view shows 951 Gaspra, similar to a Galileo image. The shape model is modified from that at Philip J. Stooke's web site; the map is modified from that at Philip J. Stooke's Small World Atlas 2000. This view of 253 Mathilde mimics the best images obtained by Galileo. Last modified 9 June 2002.